Below is information on who we are, how we operate and why we are easier. Home 2 Home Carpets are a new breed of carpet company. Our main focus is to make the whole process of finding a carpet supplier, picking the sample, purchasing, arranging fitting and after care simple. With our experience and time in the carpet industry, we know that choosing a carpet or flooring can be a stressful and time consuming exercise. Travelling to endless stores in search of the right carpet and quality which end up looking a world apart from your home due to showroom lighting and presentation. We can help make that whole process very simple for you. We have a mobile showroom carrying thousands of samples allowing you to relax and choose at your own home. More importantly, this speeds up the process allowing us to quote on site and more importantly, you can see a range of samples in your own home. We have an expert fitting service which you can find out more below. With over 20 years experience, each fitter will ensure your flooring is installed to the highest standard possible. Convenience for you and us. It makes sense. We carry 1000's of samples, we literally have a van load. We have the same offering as most chain carpet showrooms. The only difference is we aren't carrying the stock around! Our range of fitters are of the highest standard with over 20 years experience each. 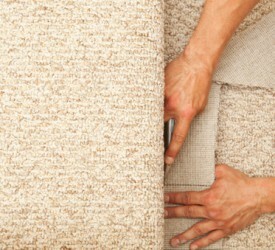 One of the most crucial aspects for a new carpet is the fitting. It’s great having a plush new carpet but if its installed incorrectly, you won’t be happy. We have an expert range of fitters who we have accumulated over the years so we can rest assured that when we sell you a brilliant carpet, its also installed to the highest standard. With advances in the last decade, underlay has come an extremely long way. One of the main benefits with underlay on the market nowadays is the use of PU foam which not only last longer but also carry a higher tog than rubber. To better explain this, a carpet with the old rubber underlay had approximately 1 tog. Combining this with the average carpet, a total of 2 togs was achieved. With PU underlay coming in at 3+ tog, you can reach almost 5 tog with most carpets. This is like walking on a cloud compared to hard, no give floor. We also offer artificial grass. Below is some more information and some benefits. Artificial grass is becoming a trend across the UK for many homes due to its overwhelming benefits. Durability is one of them. You can say goodbye to patchy and blotchy grass in the summer, mud in winter. Frequently used areas such as walk routes are a thing of the past. You are left with a plush green landscape free of any unpleasant surprises. Its a lot cleaner to. Great for pets and kids to play on. With an array of styles available, you can still achieve that natural without the fuss. People all over the UK are investing in artificial grass to not only make the most of their garden but to also save time and money long term. Hardly any maintenance required meaning you can spend more time in the garden enjoying it. Don't worry about dry summers or muddy winters, artificial grass looks great all year round! You will save money long term on maintenance costs and its a great investment for your property. Book your FREE Home 2 Home Appointment TODAY! We can come to you at an arranged and convenient time. MADE WITHAND Web Design by webcompare.